These 1882 Morgan Silver Dollar coins have a diameter of 38.1 mm and are made of a 90% silver and 10% copper composition. Each of these Silver Dollar Coins contain .0321 troy ounces of silver. These Morgan Silver Dollars are graded using strict Photograde standards. Excellant coin with an investment. Arrive safely to residents. I have placed several orders with U.S. Quarters and every coin I've ever received has been of great quality and I've never had a problem. I will continue to purchase my coins from here. 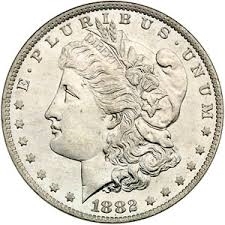 The EF-40 Morgan silver dollar is very nice!